Clattering in a rickety pickup truck through the dark, sandy streets of Puerto Villamil I struggled to keep my eyes open. It was four in the morning in the Galapagos Islands, and I had woken up just minutes before. As my eyelids sunk lower and lower, the truck motored its way towards the port, occasionally stuttering to a halt to allow other sleepy students to haul themselves into the back. Hours later and wide awake, we were skirting around the southwestern coast of Isla Isabela in a dive boat. We had left Puerto Villamil behind with the sunrise and had seen no sign of human habitation since. To our right was the lush verdant incline that was the southern side of Cerro Azul. Turning around the southwest tip of Isabela however, the landscape turned alien. All traces of greenery had disappeared, replaced with foreboding dark cinder cones and jagged a’a lava flows. Still we pressed on. 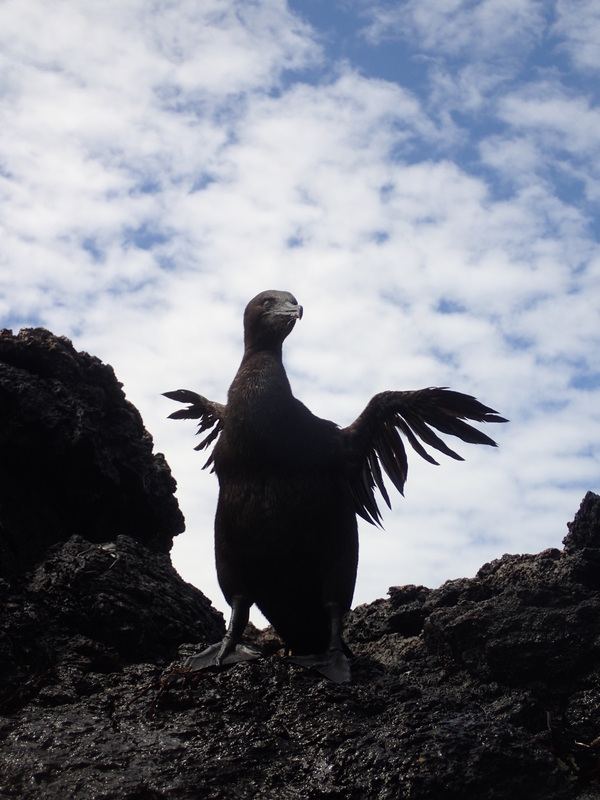 Our destination was Punta Morena, home of the flightless cormorants. Flightless cormorants, officially known as the Galapagos cormorant, are anomalies in the cormorant family. Unlike penguins, where the whole genus is flightless, the Galapagos cormorant’s inability to fly is unique among its closest relatives. This change likely evolved as the isolated population’s need for underwater mobility outweighed their need for flight. By putting less energy into wing growth, the cormorants could develop large paddled feet and a hefty body made for diving deep. This evolution made them the largest member of the cormorant family, 35 to 40 inches in length, but with wings only a third of the size necessary for flight. My first sight of these birds was underwhelming. 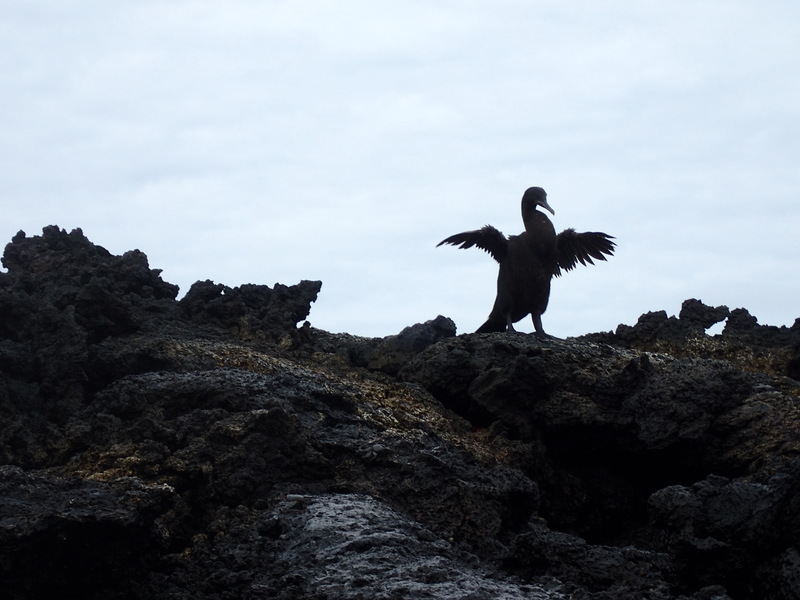 Black and scraggly, the cormorants were perched atop a rocky lava shore just a few yards from our boat. With their stubby wings outstretched in the vestigial remains of a now pointless wing drying behavior, the birds seemed awkward and ungainly, like an evolutionary joke. Their most, and only, striking feature was the bright turquoise of their eyes. As our boat continued up the coast, sightings of sunning cormorants became more frequent. Finally, we entered a little cove and were told to begin gathering our snorkeling gear. The water looked far from inviting. It was a deep slate grey, fed by the cold water upwelling of the Pacific Deep Water Current. Jumping in, I found the water to be as cold as it looked. Hoping the swimming would warm me, I began to paddle through the water towards the cormorants on shore. About halfway to the shoreline, I was suddenly surrounded by several beady-eyed, long-necked juveniles. Due to their lack of naturally occurring predators, they were fearless, and as curious as I was. One swam right up to my camera and started nipping it with his long, hooked beak. I was startled and delighted all at once, forgetting even to take pictures in my excitement. Abruptly, he and his fellows lost interest. As they sped away through the water, I could see the significance of the birds’ evolutionary changes. Gone were the awkward earthbound birds. I was in their realm now, and their grace in the water mocked my clumsy attempts to keep pace with them. For the rest of the snorkel, I saw the cormorants on their terms and their terms only. Occasionally I would attempt to follow one, but I was no match for their paddling feet. Eventually I learned the futility of seeking them out and began to focus on other animals. Even without the occasional cormorant sighting, it would have been an amazing snorkel. Sea turtles and sea lions swam in and out of view. Large, yellow chocolate chip sea stars speckled the ocean bottom alongside bright red algae, while clusters of round, orange cup corals hid under rocky ledges. Eventually time was up and I slowly headed back to the boat, reluctant to relinquish my last sighting of a cormorant heading into the ocean depths. Only upon entering the boat, did I realize how cold I had been. My whole body was shaking, and I was having trouble wiggling my toes. As the captain of the boat handed me a steaming cup of coffee spiked with a local sugar cane liquor, I scanned the clear water for a final view of a cormorant. None were visible in the water, so I contented myself with a last glimpse of one sunning on a nearby rock, stubby wings resolutely aloft.